Apple today reduced the price of AppleCare+ for 9.7-inch iPad and iPad mini models to $69 in the United States, down from $99. AppleCare+ was previously $99 for any iPad, but that price now applies to iPad Pro models only. The lower $69 price for the iPad and iPad mini has been offered by select Best Buy stores for the past several months. AppleCare+ is an optional warranty plan that extends an iPad's or iPad mini's warranty period to two years from the original purchase date of the device, and adds up to two incidents of accidental damage coverage, each subject to a service fee of $49 plus applicable taxes in the United States. AppleCare+ for iPad also provides 24/7 priority access to support advisors via online chat or phone for up to two years after the device's original purchase date. Without the plan, iPad owners are covered by Apple's limited one-year warranty and an initial 90 days of complimentary telephone support. Apple charges out-of-warranty repair fees of $299 for the iPad mini 3 and iPad mini 4 and $249 for most 9.7-inch iPad models, including the sixth-generation model introduced at its education event today. By comparison, the upfront cost of AppleCare+ for iPad plus one incidental fee is $118, so the warranty can pay for itself. 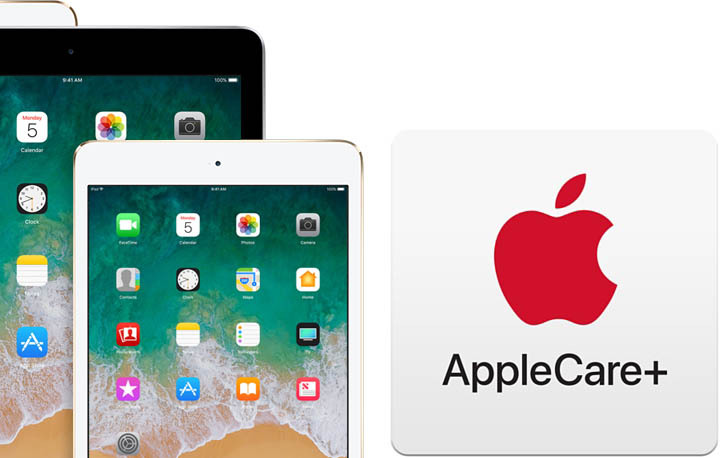 AppleCare+ pricing for 9.7-inch iPad and iPad mini models has also been reduced in other countries, including Australia, Canada, Singapore, and the United Kingdom. Prices vary based on local currencies. Speaking of the mini, I wonder how long Apple intends to sell the current A8 model? A new A10 based mini with Apple Pencil support should be able to price out at around $249. I know some (a lot?) think the mini is dead but I still think we’ll see a refresh. The screen area is almost twice as large as a 6.5” iPhone X Plus and it would cost 75% less, and with Pencil support I think it would sell pretty well. It might even have to price at $279-299 because it could negatively affect gross margins otherwise, due to cannibalization of the larger 9.7” model. I bought the 9.7 iPad Pro but would have bought a Mini if it had pencil support. I like the smaller form factor. I purchased a Gen 5 iPad (2017) a few days ago but waited to add AppleCare. I keep trying to add AppleCare but they are charging me $99 still. Wonder if I'd have to return and re-buy it? regardless, return it and buy the 2018 if only for the better CPU which will last you longer. Return the 2017 iPad and get the 2018 one; there is no good reason to keep the obsolete one.